It probably won’t surprise you to learn that English is the most common language on the web. However, it’s far from the only one. In fact, nearly half of all internet users have another native language aside from English. This means many websites are needlessly excluding a significant portion of their audiences. To avoid losing out on potential conversions and revenue, make the smart move to localize your site by translating it into one or more other languages. While this might seem difficult, or even impossible if you aren’t multilingual, you don’t need to worry. Today, it’s easier than ever to translate and localize a website. In this article, we’ll discuss the benefits of website localization and what it entails. We’ll also show you some methods you can use to create a multilingual site — even if you don’t speak a second language. Let’s go! According to W3Techs, over half of all websites use the English language. This is hardly unexpected, considering that it’s the most commonly spoken language among internet users. In fact, more than a billion internet users speak English. However, while English may be the most common language, that’s not by a wide margin. It turns out that almost a fifth of internet users speak Chinese, for example, while over 8 percent speak Spanish. That’s hardly surprising, considering how common those languages are. What is somewhat shocking is how few sites cater to those same users. Returning to the first study we cited, it turns out that not even 5 percent of sites provide Spanish as a language option, while Chinese is available on less than 2 percent of sites. This means that literally billions of internet users are forced to use websites in a non-native language or are left out of a large portion of the web altogether. We should also mention that this strategy is sometimes confused with a process called internationalization, or ‘i18n’ (for the same reason as above). Where localization aims to adapt an existing product to suit another culture, internationalization is the process of making that product easy to localize in the first place. The WordPress Polyglots team is an example of how both l10n and i18n can be implemented in a single platform. This team works on making all aspects of WordPress easier to localize across regions, including providing help for theme and plugin developers. It’s also important to note that localization is not only about translating your site’s text. Although that is a key part of the process (and we’ll discuss it more in a moment), localization also involves adapting your site to another culture. For instance, it means making sure that currency, measurement units, and general terminology are updated accordingly. Localization can also mean altering other aspects of your site to suit different cultures. It turns out that what’s considered strong web design can vary based on your region. For example, some design elements like testimonials are much more highly valued in the US than they are in parts of Europe. Ultimately, this means that if you want to localize your site, you’ll need to do some research. For an idea of what can happen when a brand fails to do this, you can read about the time KFC told its Chinese customers to “eat their fingers off” or when Apple released a keyboard in Europe that wasn’t actually usable with many European languages. By now, you might be thinking that localization sounds like a hassle. While it will take some work, it turns out that it’s a crucial task for most sites. The fact is that proper localization benefits everyone. Not only does it help make the internet a more open and welcoming place, but it offers advantages to you and your site as well. Before we get into the practical details, therefore, let’s look at why you should bother localizing your site in the first place. Target a larger audience. Localization opens your site up to people who would otherwise not be able to use it. Improve SEO and create localized SEO campaigns. You can create a unique URL for each localized version of your site, for instance, which can boost their rankings. Increase your conversions. 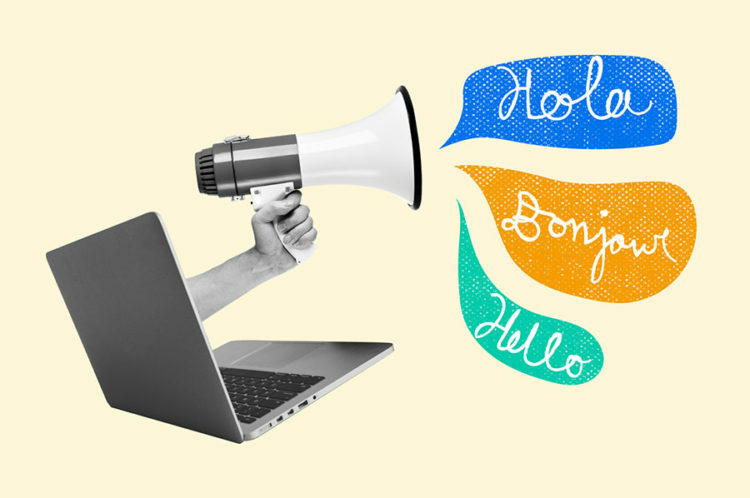 Users are more likely to convert if your site is in a language they’re fluent in. Make your site more accessible. You’ll make it much easier for those who have a limited-to-no understanding of your site’s primary language to read and absorb your content. As you can see, localization is mutually beneficial to all parties involved. However, while this is something most website owners should consider, that doesn’t make it a task you should jump into without some careful planning. Naturally, the first thing you’ll need to do is consider which languages and regions to focus on. To narrow down your options, you can take a close look at your site’s analytics, as this will tell you which countries you have the most visitors from already. For instance, if you have plenty of traffic from Spain, you might want to consider creating a Spanish version of your site. It’s also a smart move to perform keyword research for specific locations. This will help you determine the demand (or lack thereof) for your services or products in a particular region. By doing this, you could end up finding an untapped market that you can appeal to by creating a localized site, especially for that audience. Once you’ve nailed down the major languages and regions for your audience, it’s time to consider the practical realities of localizing your site. We mentioned previously that this will require some market research, to find out how your site will need to change in terms of layout, images, messaging, and so forth. If you have the funds for it, you might even want to hire a team to help you with this project. Hiring translators is usually the most effective way of localizing a website, especially since you’ll need to maintain the new version of the site over time. Whenever you update or add content to your main site, it’s important that you are able to do the same on the localized versions. Finally, you’ll also need to think about implementation and compatibility. Fortunately, if you’re a WordPress user, you have much less to worry about. There are actually multiple plugins that can help you localize your site, including tools that perform automatic machine translation. Translating an entire website is typically the most time-consuming and costly aspect of localization. Depending on how much content your site contains and how often you update, this can require a significant investment and plenty of manpower. However, there is a way to make the process considerably easier, by letting a machine do the bulk of the work for you. This is known as automatic translation or sometimes machine translation. Chances are you’ve seen this in action on a smaller scale if you’ve ever used a tool like Google Translate. Without getting too technical, solutions like these automatically translate large volumes of content automatically from one language to another. The best part is that you can implement such a system on your site, automatically translating all text content as soon as it’s added. As you can imagine, this is much faster and cheaper than hiring one or more dedicated translators. Since there’s no waiting period between creating the original content and the translated version, you can ensure that every version of your site is up-to-date at all times. The main drawback of machine translation is that no solution is perfect, even though the technology has progressed rapidly since the days of Babel Fish. As such, you will most likely need to edit the translated versions at least, to make sure the content is still correct. However, even this task is far less time-consuming than translating everything from scratch. Another important consideration is which tool to use. We’ll look at some of the best options in a moment, but it’s critical you pick one that is compatible with all aspects of your site. For example, if your WordPress site contains a WooCommerce store, your translation plugin must be able to translate the e-commerce aspects as well. Automatic translation is a great way to save time when localizing your site, but you’ll need the right tool for the job. Fortunately, as is usually the case, several WordPress plugins can help you out. We’re going to look at a handful of the best translation plugins right now, one by one. Weglot makes it easy to create a multilingual site, even if you don’t speak any additional languages. This plugin uses machine translation to generate a fully-translated version of your entire site, which includes all page elements. It’s also compatible with just about any plugin or theme, including WooCommerce. Pricing: Weglot offers a free plugin and a series of premium plans, which start at €9.99 (roughly $12) per month. Polylang makes it easy to configure your site for localization. With this plugin, you can set the language for each post, and then create translated versions right in the standard WordPress editor. By default, Polylang offers the tools needed to create manual translations. However, you can also use it in conjunction with its sister plugin, Lingotek Translation, to perform automatic translations. Pricing: Polylang is available as a free plugin, as well as a Pro version that costs €99 (roughly $114) for a single site. WPML is one of the most popular translation plugins, and it’s not hard to see why. This tool provides an intuitive interface that makes it easy to create and edit your translations. However, in contrast to the other plugins we’ve mentioned so far, WPML is mostly focused on manual translation. It works by assigning specific users the role of Translator, which makes it simple to track and manage your translation tasks within WordPress. 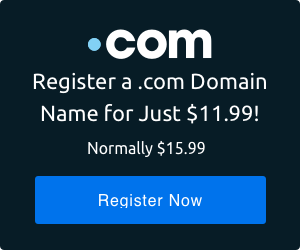 Pricing: WPML offers a number of paid tiers, which start at $29. Now that we’ve looked at a few tools, let’s walk through how you can get started with localization by translating your site. For this example, we’ll be using the Weglot plugin that we covered earlier, as it’s free and includes automatic translation by default. This makes it an ideal choice if you want to test the waters before committing to a solution. To start off, you’ll want to install and activate Weglot. Once you’ve done that, you’ll be prompted to configure the plugin. You’ll need an API key here, which is used to connect your site to Weglot’s cloud translation API. To get your own key, simply register for a free Weglot account. Once you’ve set up your account, you’ll be shown your API key. Copy this, and return to WordPress and the plugin’s settings. Paste your API key into the corresponding field, and then specify your site’s standard language and which language(s) you want to use for your translations. Then, click on Save Changes when you’ve finished. As soon as you’ve done that, you’ll see a message informing you that your site is now multilingual. 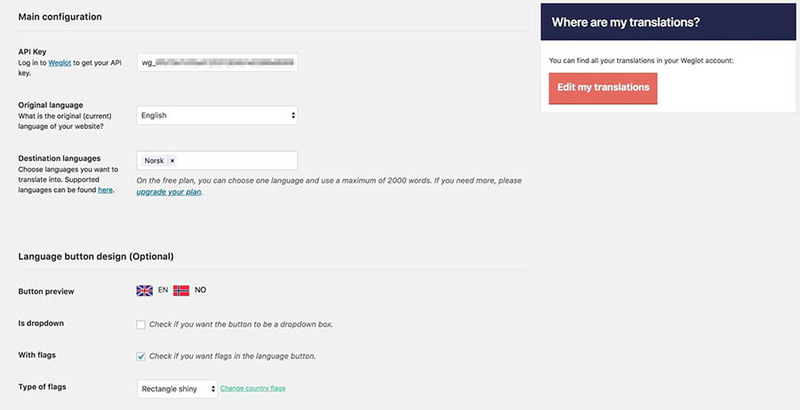 If you take a look at your site, you’ll see a new ‘language picker’ feature in the bottom-right corner. When you click on this, you’ll see both your site’s default language and the one(s) you specified for translation. If you select one of those alternative options, the site will reload and display in the specified language. You can also see that the URL for the site has changed, to include a code for the translated version. 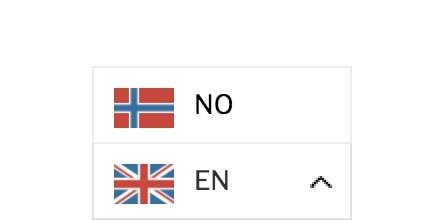 In our case, since we chose Norwegian, the plugin has appended /no/ to the end of the URL. 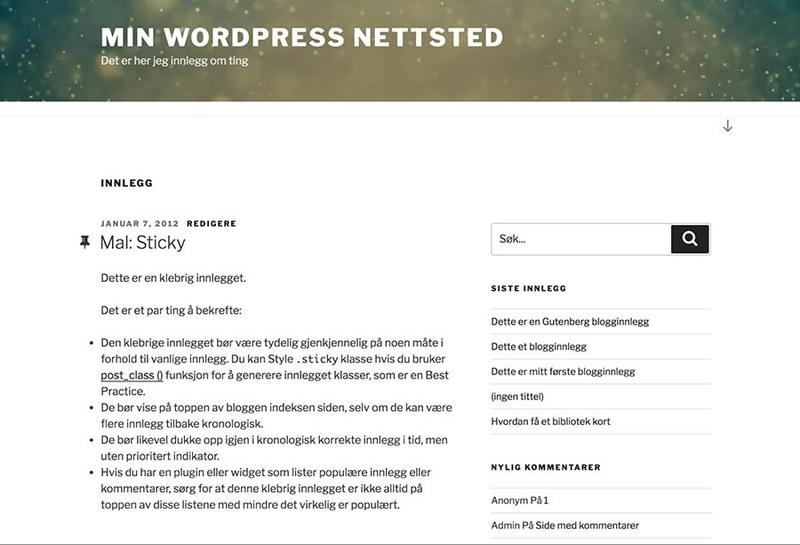 As such, if the site’s address were https://example.com, you could access the Norwegian version by using https://example.com/no/. Now, this is just scratching the surface of what you can do with automatic translation. For one, you can return to the plugin’s settings to customize your language picker, both in appearance and position. On this screen, you’ll also see a link to your Weglot dashboard, where you can manage and edit your translations. This dashboard gives you total control over all versions of your site and even shows you when and who edited individual text strings. This means that you can generate a translated version of your site in seconds, while also hiring a professional to edit the end result (if you like). As we mentioned earlier, translation is only one aspect of localizing your site. However, saving time when it comes to translating your site’s content will help you immeasurably, as it frees up resources to perform the necessary research and localization work on the rest of your site. Assuming all of your site’s potential visitors are fluent in your native language is not just arrogant, it can even be harmful to your business. By shutting the door on a significant portion of your audience, you could lose out on both traffic and conversions. As such, it’s well worth creating localized versions of your site. Do you have any questions about localizing your WordPress website? Join the DreamHost Community and let’s start the discussion! Ellice comes to us from House DreamHost, the first of her name, Gatekeeper of All Things Content, Protector of the Brand and Ruler of Social Realms. tl;dr - Ellice is the Content Marketing Manager at DreamHost and oversees all social media and content efforts.